Written by: Priya Potapragada on October 30, 2017. In 1983, a group of volunteers set out to create a summer camp unlike any other in Canada – a camp where children diagnosed with cancer can feel adventurous and can just be kids. Located in the province of Ontario, Camp Oochigeas (affectionately known as “Ooch”) is the only overnight camp in Canada that is equipped to deliver intravenous chemotherapy and blood transfusions onsite. An oncologist and nurses are available around the clock and reside in the camp for the duration of these programs. 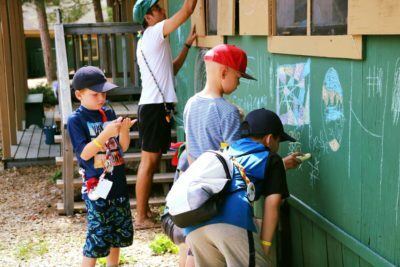 The goal at Camp Ooch is to help alleviate some of the trauma experienced by the children while going through chemotherapy and radiation. Since the organization does not receive government or hospital funding, generous donors have enabled children diagnosed with cancer to have the opportunity to attend Ooch at no cost to their families. Ooch provides children participating in the camp the opportunity to build experiences by engaging in activities such as cooking, camping, magic, making movies, and even rock climbing & jetskiing. The children are able to connect with their peers and, most importantly, enjoy being kids. Camp Ooch strongly believes that children with cancer should focus on who they are, not on their illness, as such,Camp Ooch is also known as the “social cure for cancer”. Those involved say that the camp has had a positive impact on their child’s ability to be independent, confident, make friends, and have an improved outlook on life. “At Ooch, no one really pays attention to the fact that you have cancer, because everyone else does”, said one camper. Looking forward, Camp Oochigeas aims to serve 50% more children by 2021 and a grant facilitated by CAF America has brought them a step closer to achieve their goal. This grant has given a child diagnosed with cancer the chance to attend four and a half days of Ooch’s programs. If you would like to support a child diagnosed with cancer to attend Camp Oochigeas, please donate here.